Anji White Tea is actually a green tea! It is called 'white tea' because its leaves are very light in colour due to its low cholorophyll and polyphenol content. 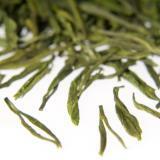 Its procecessing makes it a green tea - withering, pan firing and shaping, followed by firing gently over charcoal. The specific variety of tea bush was dicovered growing wild in the 1950's and grows at over 800m. The theanine (an amino acid) content of this tea is up to 4 times higher than other green teas giving it its extremely smooth mouth feel and rich 'umami' taste which is best brought out with careful preparation - the secret is to use 5g of tea in a gaiwan and steep for 3-5 minutes in very cool water of 60-70 degrees. ANJI white tea is a special tea! It grows up in ANJi a beatiful and quiet contry town. There is a old tree over 500 years old and the first tea come from where. It is very famous in China and a lot of people from all of the world came to our hometown to look for these teas. It is a green and healthy tea full of amino acid. It taste sweet and smells good. It can make the air clean and your living life to the full.